Home Care Assistance and Home Health Care in and around Pasco, Pinellas and Hillsborough Counties, and the cities of Clearwater, Holiday, Largo FL, St Petersburg and Tampa. With over 3 decades serving Pasco County, Pinellas County and Hillsboro County, Bayshore Home Care is one the most experienced home care assistance providers in Florida. We believe that everyone deserves the opportunity to remain independently in their home, and that is why our home health aides provide the personal care assistance necessary to ensure our client’s health and dignity. We recognize that everyone’s needs and level of functioning are unique, which is why we custom tailor our services to each individual we serve. Plus, our skilled caregivers offer an array of home care assistance services, so as your needs change, we can adapt to meet them. Fall Risk Intervention — Elderly or recovering patients are at risk for falling or re-injury if not properly assisted. At Bayshore Home Care, our experienced home health aides are trained to provide assistance with walking and transferring to and from bed to chair or mobility aid. They can also help patients uphold exercise plans to improve and maintain mobility and flexibility. Personal Care — Proper hygiene is not only an important part of maintaining physical and mental health, but it also promotes a sense of well-being and dignity. Our caregivers are here to provide assistance with bathing, dressing, toileting and grooming for those who experience difficulty managing their own personal care. We understand the sensitivity that comes with this level of home care assistance, and our caregivers are make every effort to provide a safe and comfortable environment for personal care. Medication Reminders — Taking prescribed medication at the appropriate time is vital for maintaining health and wellness, however remembering to take it can be difficult. Our caregivers can keep track of what medications need to be taken and when, providing gentle reminders when necessary. Homemaking & Companionship — While remaining comfortable in the home is the goal of our clients, maintaining daily household tasks can be cumbersome. From light housekeeping and meal preparation to running errands and laundry, we can provide you with the assistance you need to enjoy a clean and relaxing home environment. 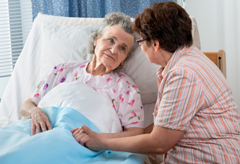 Respite Care — Caring for a loved one is both rewarding and challenging. Since everyone needs a break and time to take care of themselves from time to time, Bayshore Home Care is pleased to offer respite care, allowing family caregivers to enjoy some time to relax. At Bayshore Home Care, our friendly, reliable and compassionate caregivers are skilled in meeting the individual needs of our patients in their home, and are available 24 hours a day, 7 days a week! We are pleased to offer home care assistance to individuals throughout Clearwater, Tampa, St Petersburg, Largo, FL and the surrounding communities. Contact us today to learn more. We look forward to assisting you!